Sainsbury’s has always done a great range of gluten free sausages in their finest range, but when they contacted me to tell me their whole range of Taste the Difference sausages are now gluten free, I was over the moon. There had been a few flavours I had wanted to try but couldn’t – and now I can! They very kindly sent me a voucher to sample a few flavours, and I went completely overboard and bought the entire range (apart from lamb, which I can’t stand). Oops! One of the things I hate the most is food waste, and these new packs mean you’re less likely to throw anything away – they come in packs of 8, which you can snap in half! This means if you’re not planning to cook the whole lot, you can put half the pack in the fridge or freezer, already sealed, and it saves on extra wrapping or forgetting half-empty packs. My favourites so far are the Toulouse sausages, they taste delicious! I’m yet to try the chorizo ones though, which I am excited about. I love the fact they are all so meaty, they don’t feel like they’ve been padded out with loads of wheaty-rubbish. Mostly I’ve been eating either bangers and mash or cold sausages as a snack, but I cooked up the vension ones and had them with balsamic caramelised red onion, rocket and brie in some gluten free Tesco tiger bread rolls. They were amazing. I also used the Sicilian sausages for my recipe below. This is delicious hot or cold – and if you leave it until the next day the flavours really mature. I think any of the sausages would go well with this, it’s a pretty flexible dish! Dice the red onion. Peel and crush the garlic cloves and add both to a pan with the coconut oil. Fry on a low heat for around 4-5 minutes until the onion and garlic have softened. Add the mixed herbs and balsamic vinegar, turn to a medium heat and cook for a minute. Add the sausages to the pan . 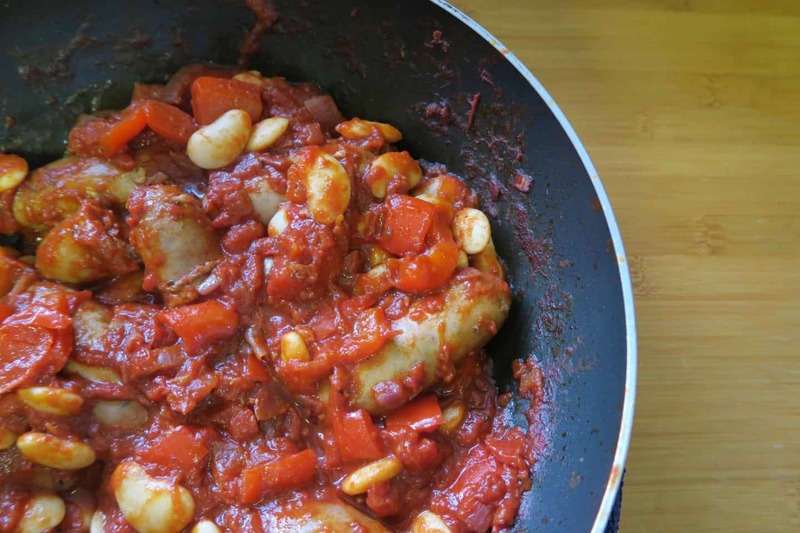 Chop the red pepper and add this too – stir regularly on a medium-high heat for 3-4 minutes, until the sausages start to brown. Add the tinned tomatoes, tomato puree and a little water (about 1/4 of the tin – I use this to swill round the tin to get the last bits of tomato juice!). Bring to the boil then turn down and simmer on a gentle heat for 25 minutes. Drain the butter beans and add to the casserole. Stir well and cook for a further five minutes – and then serve. Delicious with roasted sweet potato or some basmati rice! Have you tried the new Sainsbury’s gluten free sausages? Which are your favourites?Comment below and let me know what you think! Previous Post August favourites: gluten free chicken kievs, pizzas, pies and cake!